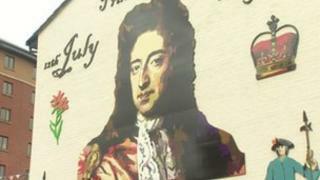 A portrait of King Billy, which was painted to replace one of the most famous paramilitary murals in Northern Ireland, has been unveiled. Work began in June to paint over a huge Ulster Freedom Fighters mural at Sandy Row in south Belfast. Its removal followed a year of talks between residents and local businessmen. It was officially unveiled by Social Development Minister Nelson McCausland. "This is the culmination of a lot of soul searching and tentative steps and marks a new chapter in the long and proud history of Sandy Row," he said. "This is a new and innovative approach to the delivery of neighbourhood renewal which is critical to help communities like this move forward and forge a better future for all its residents. "They are sending out a loud and clear message that Sandy Row is an inclusive and progressive community, and I have no doubt this will help to stimulate, not just social, but much-needed economic investment in the area." Leading loyalist Jackie McDonald said the move was part of a wider regeneration project. "We're trying to move on, we're trying to re-image and show that loyalists aren't just knuckle-headed Neanderthals, as some people would try to make us out to be," he said. "The people of Sandy Row deserve an awful lot of credit for this change, they've suffered here for 40 years." The paramilitary mural was painted out by contractors from the Housing Executive following consultation with the local community. The re-painting has come about after businessmen told paramilitaries the mural - which is one of the most photographed of the Troubles - was bad for investment. The move is part of a wider project to give loyalist and republican communities in Belfast a new image. The new mural features William III, as he had passed through the area on his way to the Battle of the Boyne in 1690. The UFF murdered more than 250 people during the Troubles - most of them Catholics - and was stood down five years ago. Scores of paramilitary murals have been replaced in both communities. More than 30 have gone in Sandy Row, but this is the most significant sign of change in its post-Troubles landscape.